Blurb: The town of Henbane sits deep in the Ozark Mountains. Folks there still whisper about Lucy Dane’s mother, a bewitching stranger who appeared long enough to marry Carl Dane and then vanished when Lucy was just a child. Now on the brink of adulthood, Lucy experiences another loss when her friend Cheri disappears and is then found murdered, her body placed on display for all to see. Lucy’s family has deep roots in the Ozarks, part of a community that is fiercely protective of its own. Yet despite her close ties to the land, and despite her family’s influence, Lucy—darkly beautiful as her mother was—is always thought of by those around her as her mother’s daughter. When Cheri disappears, Lucy is haunted by the two lost girls—the mother she never knew and the friend she couldn’t save—and sets out with the help of a local boy, Daniel, to uncover the mystery behind Cheri’s death. Review: I received a copy of this book for free from the publisher for review purposes, all opinions expressed below are my own. Can I just say … what a heck of a debut?! I mean, really. This book sucked me in and didn’t spit me back out until wayyyyy past my bedtime! Thank goodness it was a Friday night and I didn’t have to be at work first thing the next morning 🙂 The publisher included a note in my ARC that says not to blame her for loss of sleep. I can honestly say you will lose sleep over this book! If I truly had to break this book down and sum it up in one short and sweet sentence it would be this … blood is thicker than water. 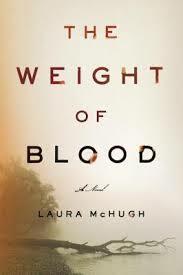 Because in real life it certainly is and Ms. McHugh manages to bring that to life within the pages of this novel. This story is told mainly from Lucy’s perspective, but it seems like just about every character had their own say at some point in the book. I enjoyed watching how everything unfolded and how Lucy came to find out the truths behind her mother’s disappearance as well as Cheri’s disappearance/murder. She had to find out a lot of nasty things about her family at the age of 16. But ultimately she set out to find the answers, she had to have been prepared for anything. The characters in this story were so well fleshed out it was almost ridiculous. Even the least mentioned (like Jamie or Ransome) fit in nicely and had a lot to say, even if they only had minor appearances. The writing was exceptional, the flow of the book was spot-on. I don’t know what I could possibly complain about in regards to this book. You will lose sleep reading this book. I can almost guarantee it will happen. The pages will turn so quickly, you will be so drawn in by the characters and their individual stories. You will be amazed at how everyone and everything seems to be connected in the end. You will know what it’s like to live in a very small town where outsiders are unwelcome and everyone knows what everyone else is up to. The atmosphere of this novel is so chillingly creepy. You will love it. I know I sure did. I can’t say anything more about this book than that I highly, highly, highly recommend it! I also read this book and completely agree with your review – what a debut!